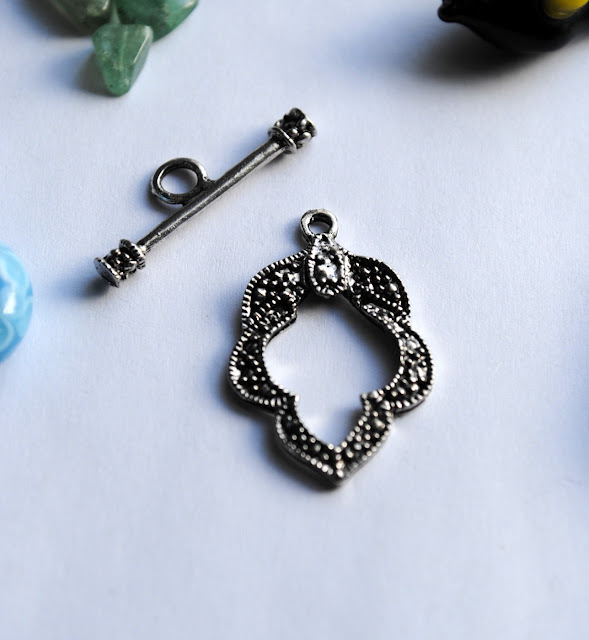 I'm really looking forward to being a part of two jewelry-creating blog hops...they are challenging and a great way to see how other people's vision and talents can inspire your own. 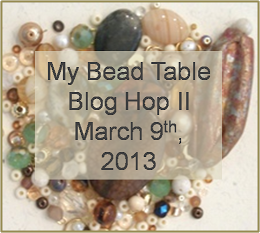 This is the first blog hop for me in March (the second will be Lori Anderson's Bead Soup Blog Hop on March 30). 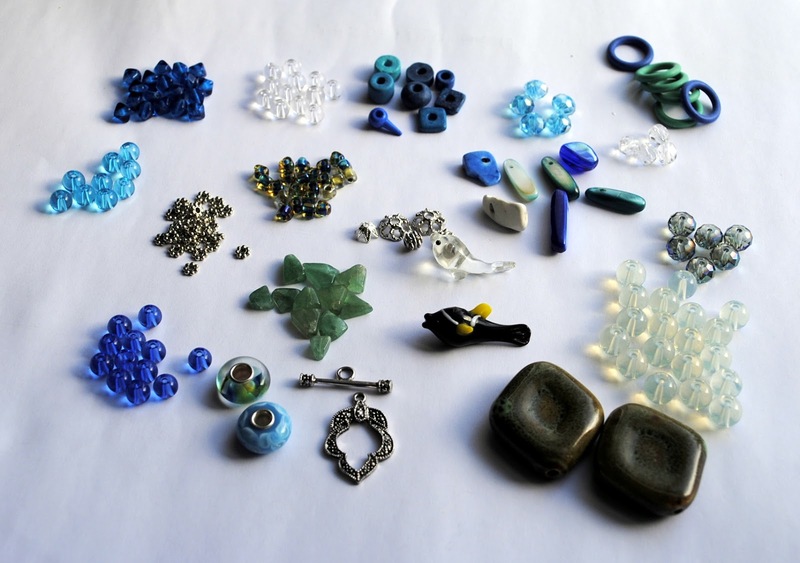 The challenge here is that Lisa Lodge, artist and mastermind, sent us a bead soup that either was based on sand (browns and beige) or sea (blues and greens) and we have to create something using those beads and a few of our own if we wanted. I was so excited to see these little triangle beads in my soup! They change colors from purple to blue to green to light beige, depending on how the light hits them. 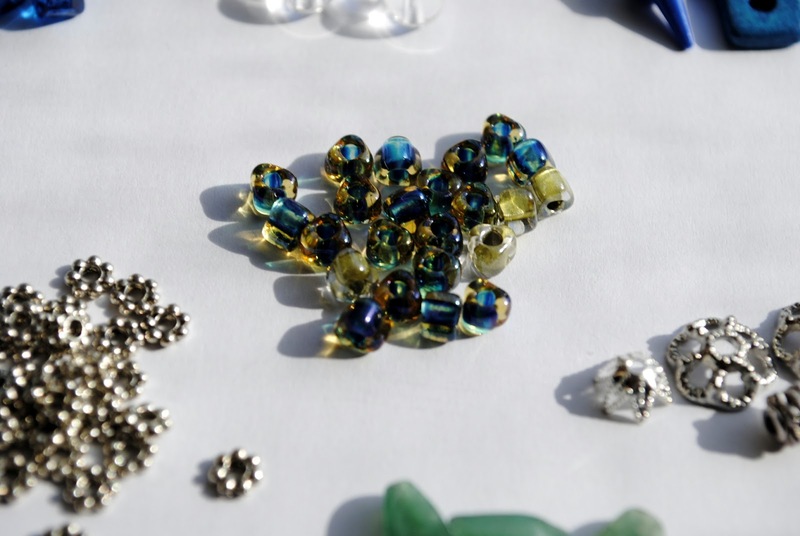 You can see the 5 mm silver daisy spacers next to them to give you an idea of how small they are. I really want to find a way to have these steal the spotlight! These beads have a hole drilled near one end so they will add some fun to how the design looks. 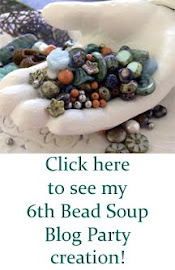 I love these green glass beads...they remind me of the waves on an overcast day. I'm not sure what these beads are made from, and the shapes are really different from what I usually work with so that will be a challenge. 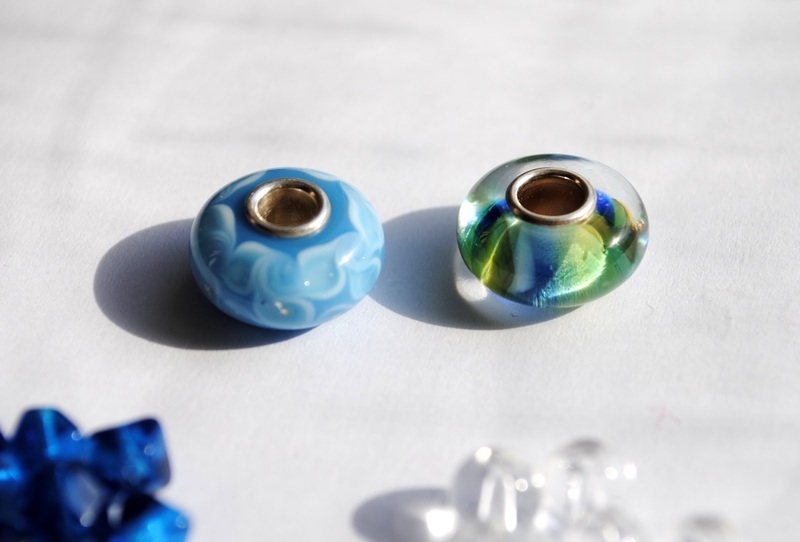 I love these Pandora-style beads and the colors are just yummy! 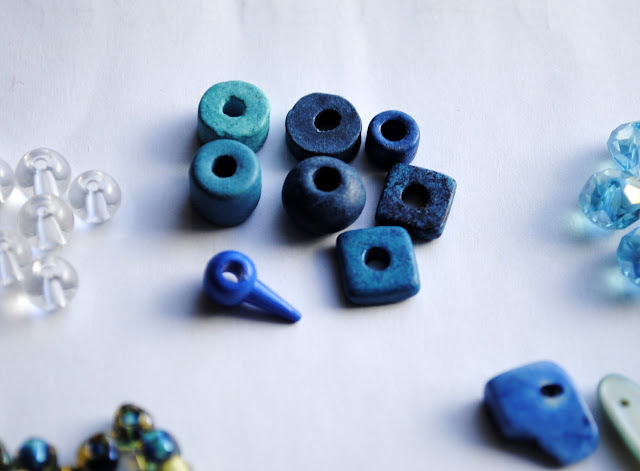 I came across an artist who used these type of beads as connector beads instead of just stringing them into the design...another idea that may or may not work. I love this clasp that Lisa sent! I'm hoping to be able to use it as part of the design and not have it hidden away in the back. I'll be posting as I work on this piece, but you'll have to wait until March 9 to see the final design! Today's Featured Artisan is Anne Hopfer - Oaklie's Fashions! You will find truly unique Fashions Accessories in her shop! Scarves, Handbags, Jewelry, Wraps and more! I love winter. I love digging out my sweaters and finding my favorite ones. I love the chill in the air. But most of all, I love the snow. Which begs the questions...why is it January and we have no snow? I know the "science-y" answers but that doesn't help when I look out my window each morning and see the sunlight NOT sparkling off the white stuff. I have a few ideas and we'll see if they work. The weather forecaster is saying there is a chance of snow off and on this week...I'll let you know if any of my bright ideas work. 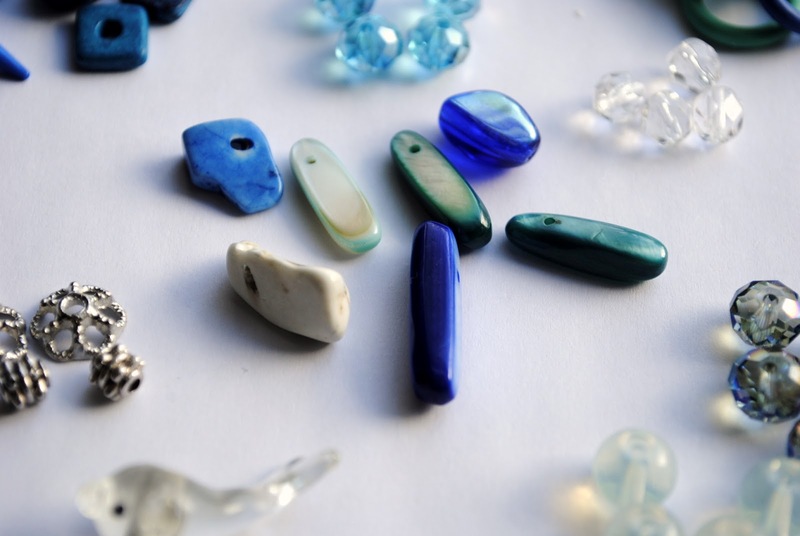 This week's Featured Artisan is Kimmi's Jewelry and Gifts. Kimberly Idalski is the Artist who creates these beautiful treasures! She is an active member of the On Fire for Handmade Team and always takes the extra time to make her blog posts for our Share the Love event unique to each artisan! This blog hop came about because of the death of a friend of Lori Anderson and Lori's desire to honor her memory. I have to admit...this was a tough challenge for me to undertake. We've just been through the holidays; my emotions and memories are scraped raw and now I'm going to try to write about a person who I still miss on a daily basis. 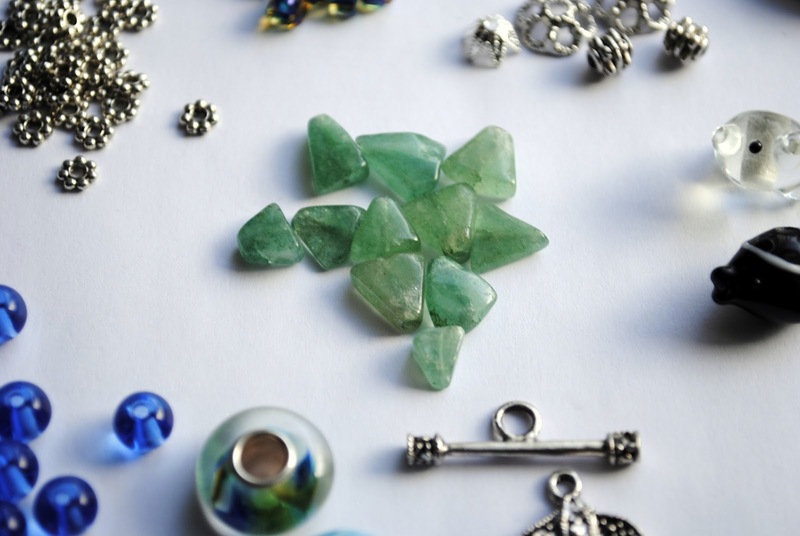 And then to narrow down my inspiration to only one aspect of a complex person and then translate that concept into jewelery...I had my work cut out for me. The person who inspired this piece is my father. He has been in Heaven for almost two years now and while I'm moving on with the grieving process it's been a tough road to walk. My faith and my family have been crucial in getting me to this point. 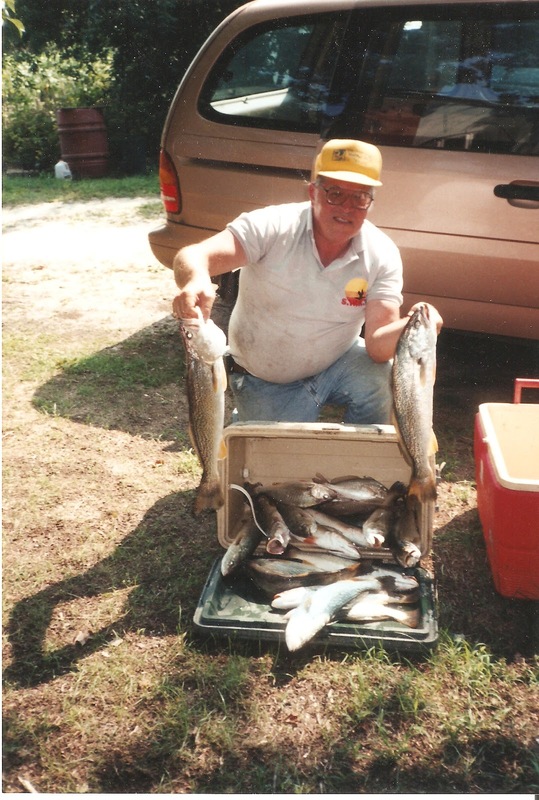 My dad was a complex individual and enjoyed keeping people on their toes. 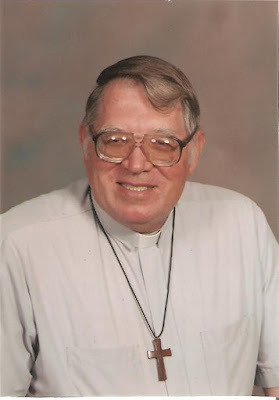 He didn't let many people see the gentle and sensitive side of himself...probably because he had been hurt so badly so often throughout his life. But as I thought about our relationship, I realized that there is one important thing that I inherited from him and that is the ability to recognize black and white (right and wrong) in a world filled with shades of grey. My dad was a man of uncompromising principles. He and I worked for the same company for many years and I saw the struggles he endured to stay true to his word even as those around him broke theirs. But he was always the go-to person when people had problems because they knew he could be trusted. I decided to take that idea of "black and white" and use it as the inspiration for my memory piece. I wanted something dramatic yet simple. I decided to start with a black and white lucite flower and build from there. 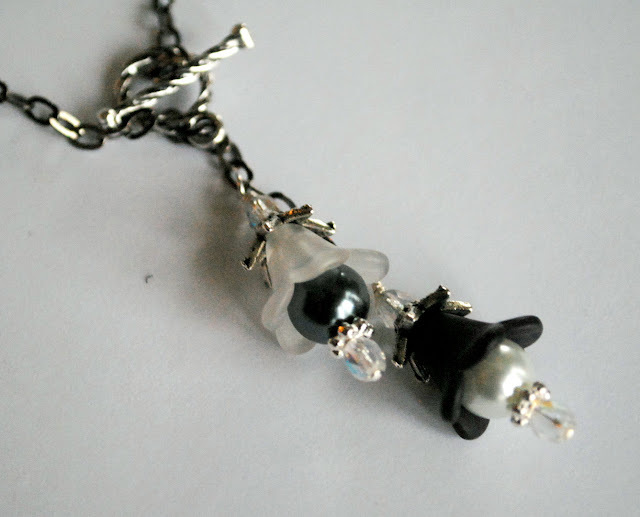 I added dark grey and white pearls with small crystal AB rounds and bright silver daisy spacers to create the flower. Then I added Tibetan silver bead caps and a matching AB crystal round to finish the look. 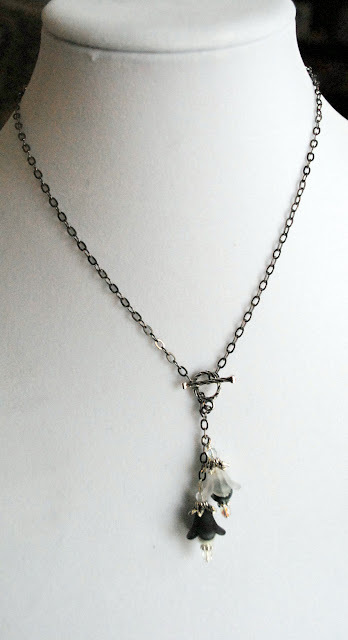 I chose to use gunmetal for the chain and used the antique silver clasp as a focal piece just above the drop pendant. When I was painting on glassware and Christmas ornaments, Dad was my biggest supporter and the person I would rely on to help me with my new designs. It seems fitting that my first new design for 2013 would be a necklace to honor him. Be sure to travel around and see how people have inspired others on this blog hop! Just click on the blog title (in pink) to visit each blog. This week's Featured Artisan is Shelly Solomon Attenberg - Handmade Creations by Shelly! You will find stunning accessories in her shop! She has beautiful ponchos to keep you warm and New to her Shop are beautiful Macrame Survival Bracelets! You can see all her Creations in her Etsy Shop!